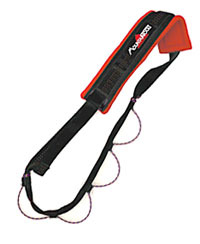 The SPEED SLING was introduced in 1988 to help us climb "gear" routes with greater efficiency and comfort. It is the original, adjustable multi-loop gear sling that is strong, and in a pinch can be incorporated into your anchor. The SPEED SLING also keeps your wired nuts, hexes and cams well sorted in dedicated loop "compartments" - just like on your harness. This spreads the load and keeps gear from "bunching up" or "sloshing" forward (or back) depending on your upper body's position... greatly improving the view of your feet plus providing better and faster access to that next urgently needed piece of pro. 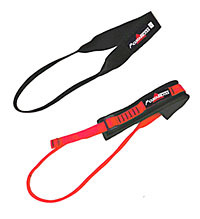 I like to carry quick draws and runners on my harness and all my pro on the SPEED SLING - with maybe a "panic piece" up front. The cord & tube loops won't snag biners and are adjustable to suit via grapevine knots. Traditional fleece shoulder pad is comfortable against both bare shoulder and neck, and this rig can be sized from XS to XXL. Add the Tarzan Kit for a great Nose-in-a-day or other long gear intensive routes. Accept no substitute! Double your hardware carrying capacity and organization for long routes requiring strategic right or left racking. Lightweight metal buckles attach to SPEED SLING. A great option to have.